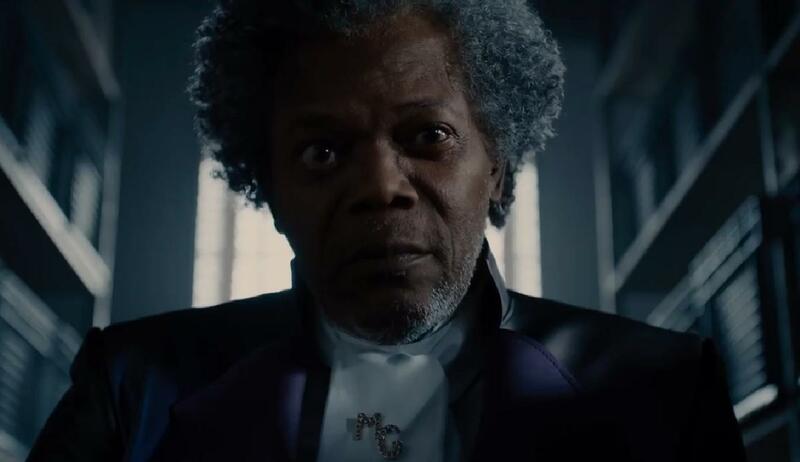 As the final chapter in M. Night Shyamalan’s makeshift, stucco superhero trilogy, Glass builds an inspired and often beautiful story with its first 90 minutes, grounding itself in a deeply personal mythology that’s able to pivot between a world where powerful beings exist in the underbelly of society and one where logic attempts to explain away the inexplicable. There’s a push and a pull to the narrative, as well as a compelling examination of what it means to standout in a society that’d rather you fit in. 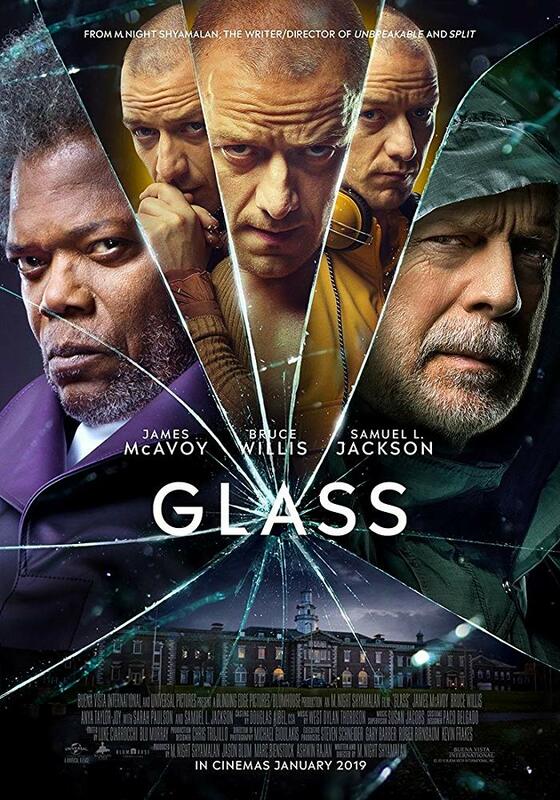 Glass has its wits about it for a long while, only to disappointingly substitute the previous nuance for an outright sloppy final half hour. This one doesn’t slowly spiderweb and crack like a windshield; it abruptly shatters to pieces. Still protecting the streets is David Dunn (Bruce Willis), the superhuman protagonist from 2000’s Unbreakable. 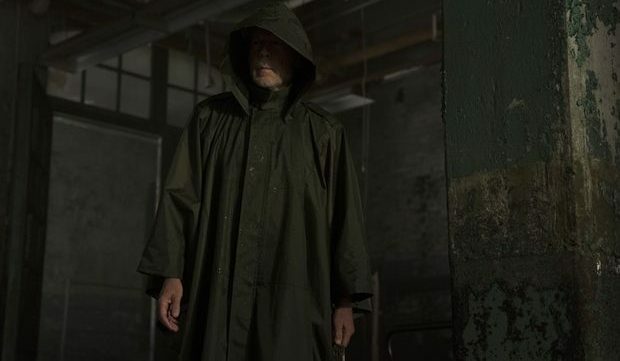 He’s known as the “The Overseer,” a vigilante dressed in a massive poncho who walks the streets by day and administers brutal justice by night. The story launches off the springboard of 2016’s Split though, landing in a space which joins the two together as one folklore fable, bonding with Glass in a shared and singular universe. James McAvoy (so brilliantly calculated and physical here, dancing between multiple identities in mere seconds) returns as the multi-hyphenate man diagnosed with Dissociative Identity Disorder, as does the brittle boned yet steely, maniacal mastermind Elijah Price (Samuel L. Jackson). This teapot trio simmers and brews and whistles. While the picture ends with a frustrating misfire, Glass manages to do enough good things to recommend seeing it on the big screen. The film has great performances (especially McAvoy in the kind of tightrope walk that puts circus acts to shame), the action is intelligible and allows the viewer to orient themselves within the setting, and the story hints at truly honest, discerned observations about the human psyche and the ever-changing equilibrium between fact and fiction. It’s a very enjoyable film to start, nearly to the point that I found myself impulsively hailing it as brilliant. But that’s not the truth. Glass wants to be seen as smart although it ends up being unexceptional, brashly driving through pot holes and assumptions which add up to deep, drowning plot holes. What begins as a solid rental car ends with four flat tires and an overheated engine. With multiple plot lines that are less carefully woven together than they are forcefully knotted, like appendages from three separate entities stitched onto one barbaric and miscreant specimen, Glass has all of the correct faculties but none of proper the chemistry. There’s a brain but little logic. There’s a heart but hardly a pulse. It has powerful arms that can’t punch and legs that can’t carry its massive load. I firmly believe that M. Night Shyamalan made 3/4 of a decent film from his gut while the wholly dissatisfying final 1/4 comes from an overly ambitious, piecemeal place to appease audiences desperate for his trademark twist and turn. The best surprises in the cinema aren’t the easy fly balls that slowly float their way into left field, but are the hard-hitting ground balls we see every inch of the way right before they hop directly into our throats. 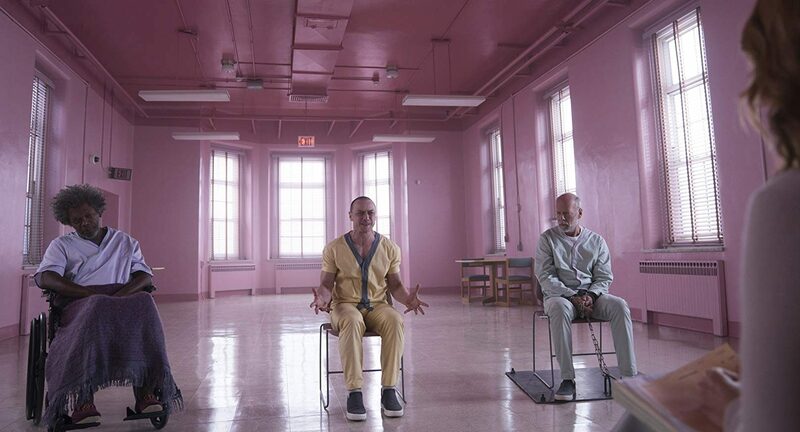 Glass illustrates that Shyamalan is still an accomplished director, and it makes me hope that his writing – somewhat in the vein of 2015’s surprising sleeper hit The Visit – trends towards a focus on building fictional worlds through real characters rather vice versa, as Glass quickly dissolves into a self-aggrandizing, preachy, single-pane window. It’s hard to see the point of it all when this cold world is so consistently fogged up by a hearty, heated, and altogether unfocused eye.